Good morning, friends. 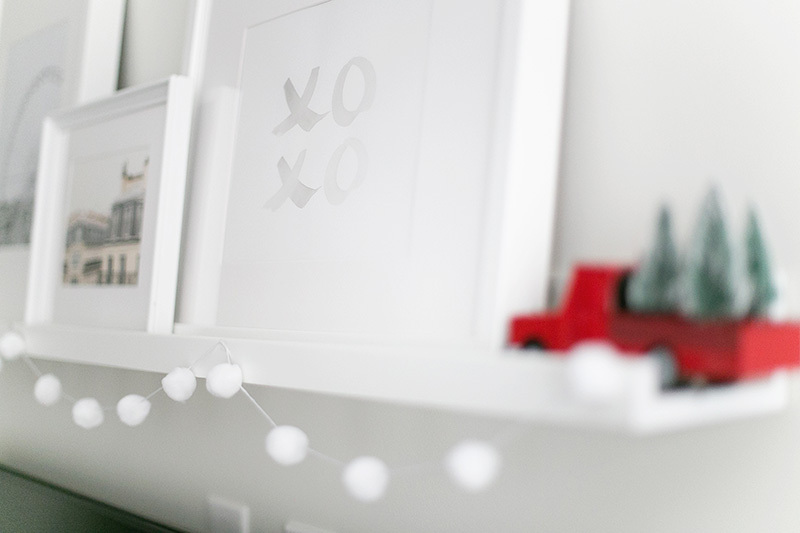 I’m back and sharing the cutest & easiest DIY. Earlier this week I made a pom pom garland for our gallery wall shelf, and then added it to our tree once we put it up. I chose to go all white and picked out a lovely metallic string. However, you could choose coloured string, twine, or multicoloured pom poms to mix it up - so much fun. Plus it’s one of those fun and easy DIY’s you could do with your kiddo’s and make a fun afternoon out of it. Then knot the opposite end and adjust your pom poms on your twine. And you’re all done! Also, I bought my supplies at Michaels, but Etsy has a fantastic selection of twine and pom poms as well. Let me know if you have any questions in the comments below and I’ll be more than happy to answer. Hope my post put you guys in a festive mood. Martin & I are officially bit by the holiday bug, and have been on a steady diet of hot coco + playing all our favourite Xmas tunes. It really is the best time of the year!! And we have sooo many fun events and holiday parties to attend this year as well. Can’t wait! What about you, friends… what are you looking forward to the most?! PS - Here are direct links to what I’m wearing: my bracelet, my top, and jeans (they’re the best).